Photography isn’t just about capturing a picture but emotions too. Taking a picture is no more a hobby; it has turned into a business now. With smartphones, iPhones, drones, DSLRs, and such other tools getting evolved over the period, the industry has gained momentum. In 2015, the digital photography market was estimated to reach $77.66 billion; it is expected to touch $110.79 billion mark by 2021. This data is enough to inspire any photo hobbyist to start their own photography business. But it takes more than just a good camera to start this business. Do you know the most important thing required to start your photography company? First of all it needs a name. Like every company out there, your business also needs a name to fulfill the first requisite. Jim Richardson has aptly said, “If you want to be a better photographer, stand in front of more interesting stuff.” Likewise, if you want to stay ahead of other businesses in your domain, pick an interesting and unique name. Here is a list of Photography Business Name Ideas for your new startup. The first step to finding a great name for your photography company starts with getting a clear identity. Think who you want to be as a photography company— pet photography, landscape photography, wedding photography, portrait photography, or fashion photography? Choosing a particular interest helps you define your niche. Most of the businesses make a mistake by not defining their market and positioning themselves for a particular role. Remember, every customer looks for a company and its services that would fit their needs in first place. This boosts their confidence that the company they are picking can do their job well. Here is an example; people looking for a wedding photography company would never hire a pet photographer. Hence, it’s essential to define your niche first and then go ahead with the naming process. Do you know your target audience and their needs? Researching the market well before kicking off a business plan is highly essential. Why? Because it helps you understand your target audience including what they exactly need. You will also be able to know the difficulties that they face. Based on these, you can create the right market message to persuade them. A name Glamour Shoot could be enticing for those who want fashion photography. But it won’t attract customers who would like to get their pet’s pictures clicked. Now you know, why determining your market before naming your photography business is essential. If one-word business name idea doesn’t suit your purpose, create a fusion name. All you have to do is to choose two words. Merge these two words to see if something new comes out of it. Take inspiration from Pentax. Two words “Pentaprism” and “Contax” have been combined to create Pentax. Another example is— Designhill. It includes two words, in fact, two easy yet memorable words— Design and Hill. The name clearly shows that the company provides graphic design services. It’s short, simple, unique as well as memorable. Usually, simple phrases are catchy. They are easy to remember too. It’s one of the best business name ideas that entrepreneurs find ideal. To have a better idea, look at given photography name ideas we have got for you. Photo Pick Studio, Happy Pet Photography, It’s All About You, Say Cheese Photography, etc. Create a list of every action verb you know. Of course, choose the ones that best describe your photography company. Take help from your family or friends to create this list. Take, for example, “Captured Memories Photography.” Here, the action verb— captured clearly shows what the business is all about. Not only a business logo design, but the name of the company should also trigger emotions. The use of emotional words in a business name is not new. For instance, Happy Maternity Photography. The name is sure to attract expecting parents. Brainstorm such words and include them in your company’s name. Another way to find cool company name ideas is to take help from geography. That means choosing location based names, for example, 42nd Street Photo, London Photography Studio, etc. But such a name may no longer be good if your company plans to expand its service or sales area. So, think twice before naming your business inspired by a particular geographical region or place. 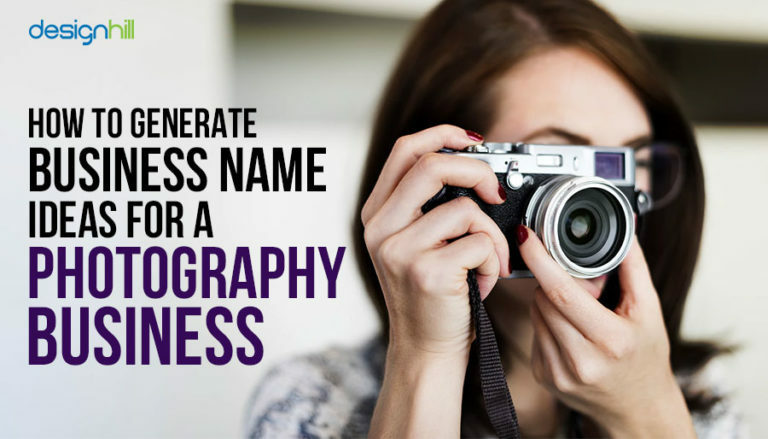 You can find an ideal name for your photography business using an online name generator. It also helps you get a domain name. Sometimes, the tool creates a name as simple as your name and the industry name such as John William, Painter. At times, it becomes tough to find the right name. Using a name generator is cheaper and fast. The online tool gives you many options to brainstorm. Their name ideas will help you sort down the names that sound easy but unique. As you’re most likely to get a website for your photography business, it is, of course, a smart idea to think about a domain name while naming your company. Choosing elegant names for photography business is tiring. If you want to focus on other aspects of your business than picking a name, hire a naming consultant to do so. A naming consultant helps you choose the right name. They are also expert in trademark laws; hence, you will get a unique name. However, for their services, you need to pay charges. Plus, you will have to wait for a few weeks to get your brand name as they take a little time in the naming process. Do you know distinctive or unique business names usually get more trademark protection? Distinctive names besides being memorable often get protection under state trademark and federal law. For example, Quicken and Xerox as compared to generic names like Pets.com, Will’s Hardware, Tom’s Pizza, etc. While there is no silver bullet for generating unique business names, they are created using fancy words. And, they sound dissimilar to their core business purposes such as Kodak film. The founder of Kodak— George Eastman coined this word as he liked the ‘K’ letter. He tried many combinations to come up with this name. However, the word doesn’t have any meaning. Sometimes different names for photography business do not make any sense until we get a logo designed. A visual representation gives a clear idea of whether a name would work or not. Create a photography logo design for better understanding. Now, associate it with your shortlisted names to see which one looks better with it. Remember, if your brand does more than just the point-and-shoot thing, a conceptual logo would be great to help your customers understand what you really do as a business. As it is most likely that you may get your social media page design created for branding or advertising purposes, picking a suitable name is significant. Run a survey or a feedback campaign to ask for your target audience’s suggestions. But if you have already gleaned few names and unable to choose one, ask your audience once again. Their suggestions and feedback will help you get a suitable name. Be it graphic designs or business names, when it comes to timeless beauty, staying classic is the key. Trend might sound tempting, but it doesn’t have timelessness. A good logo designer understands the enduring feature of classic elements. That’s why their creativity stands the test of the time. Similarly, a name that you picked to show its specialty is everlasting. Just as important as the name that goes with the goals of your photography company is finding out if someone else has the same name. If you couldn’t figure it out, here is how to do it. Begin with a simple search in Google. When you start your business in a specific state, you will have to check the registration procedure. This also requires you to register your company’s name. However, the process may vary on state wise. You can browse the SBA website that features a list of agencies. Browse the website of ICANN (International Corporation for Assigned Names & Numbers) to check the availability of your domain name based on the chosen company name. ICANN operates the InterNIC or the Internet Corporation for Assigned Names to check the availability. If the domain is available, you can register it with the help of a domain name registrar. Visit the website of the organization to find the list of domain registrars who are ICANN-accredited. Another critical step is to find out if you can officially use a name for your business as per federal trademark regulations. To do this, check the US Patent and Trademark Office resources. The website has a step-by-step procedure for company trademark application in case the proposed name is available. Here is a list of DOs and DON’Ts that you should definitely follow to avoid certain complications. Run a thorough search to make sure the proposed name isn’t trademarked or registered. Pick a unique name that is memorable, easy to pronounce or else people will forget it easily. Go for a name that looks great on the Web. Steer clear of unnecessary long domain names. Pick a domain name without dashes. In case you want to run your photography business in your country, register for a TLD. For instance, if your business is in the United Kingdom and you want to target UK clients, get a .co.uk domain. Go, create social media profiles focused on your company’s name so that your competitors couldn’t get the same profiles. Be distinctive; do not copy a business name. You may come up with a good name, but if it doesn’t showcase your core values, switch to other names. Do not pick a name that’s hard to pronounce or spell. If your target customers couldn’t figure out your name in one-go, they won’t mind turning to your competitors. Do not over-stuff your name with a trendy logo design. Keep it simple and do not go after trends. When it comes to naming a photography business, you get a lot of freedom. The scope for creativity is also there. If it focuses on delivering speciality equipment, the naming approach should emphasize this part; else it won’t convey the right message. Brainstorming or taking help from business name generators will also help you end up with a suitable name. Consider these ideas and go ahead naming your photography company!